Over hundreds of thousands of years, because of the gravitational pull of the planets or other space objects, an asteroid or comet may stray from the belt. Such space objects—mostly asteroids—that come close to Earth or cross Earth’s orbit are called near-Earth asteroids (the ones that cross Earth’s path are also called Earth-crossing asteroids). 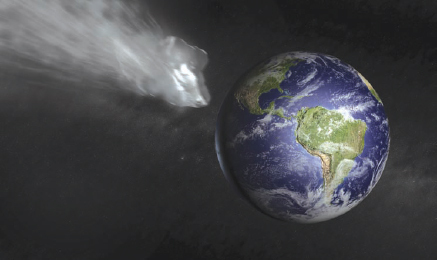 It is known that in the past some near-Earth asteroids struck Earth, creating impact craters on the planet’s surface. Meteor Crater in Arizona is a good example of an impact crater formed by an asteroid. There also seems to be an association between some of the larger Earth impact craters and the extinction of a large number of species during the planet’s long history. Scientists currently believe there are about 2,000 near-Earth objects, (mostly asteroids or burned-out comets) larger than a half mile (one kilometer) in diameter that revolve around the Sun in short-period orbits. These objects can occasionally intersect the orbit of Earth; but most of the time, we pass right by each other or we are far from each other when the object crosses Earth’s orbit. The only problem is that scientists believe that only about 7 to 10 percent of this estimated population has been discovered. Although hampered by funding cuts, scientists continue to search the sky for these potential hazards. Therefore, we do not know the actual orbits of most of these near-Earth objects. One of the theories about dinosaur extinction that has gained favor is that a large asteroid struck Earth, dramatically changing the environment. Today, astronomers are tracking near-Earth objects in order to prevent a similar fate from befalling us (iStock).